Apparently in my world it is. I haven't run a race since the 4th of July 10k. I wanted to focus on MDI and not have to switch up long runs on the weekends due to races. Believe me, there were plenty of races I wanted to do, but I held strong. But now that MDI is in my sights, a little over 2 weeks now (deep breaths), I am starting to feel that it's okay to do other races again. I'm thinking I must be making up for lost time because here is my October racing schedule. YES, I AM CRAZY! 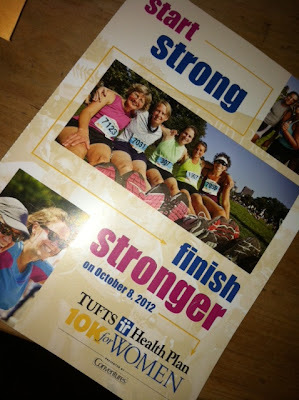 Am I crazy for signing up for the Tufts 10k? Why yes, I am. I know it. But after consulting my running gurus (Ward and Wade), I will use this race as my last speed work before MDI. I'll be in taper mode madness anyway - so why not? 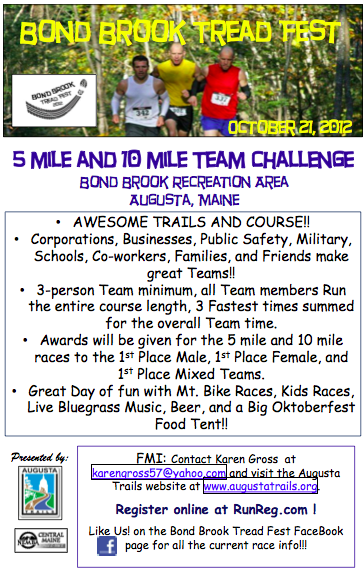 Plus it's an incredible chance to meet some of my New England FitFluential peeps. I'm really hoping that my running goddess is there am maybe I'll have the courage to introduce myself to her. Then, even crazier, I am going to do the Bond Brook TreadFest. Ward is going to do this race and has worked with the director to have a teams division. I wasn't planning on running this race at all. Actually, I was going to volunteer, but he wants the teams division to be a success, so I put together a team. I promise you, this is going to be a slow run for me. I may end up crawling through the woods, but at least I'll be part of a team of lovely ladies. Now that I have three races in a row, I need to update my playlist. I was at a loss for songs, but then it came to me. I work in a high school. 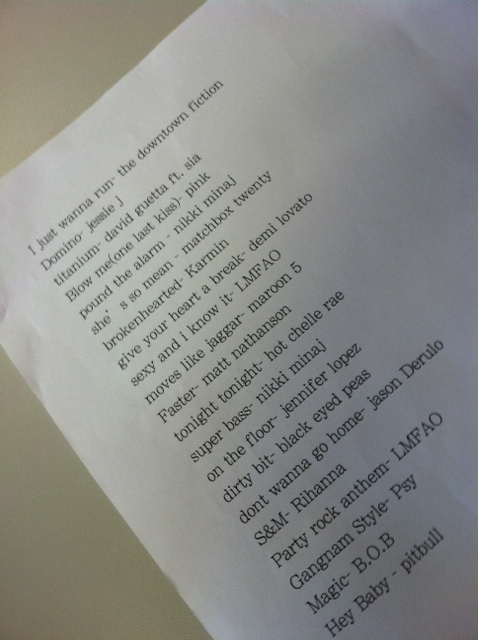 So I asked some of the girls in my advisor group and they came up with a list of songs for me. Now I need to get working on adding the songs to my playlist. Although, while I'm typing this, I just remembered that music/earbuds is not allowed for the Bond Brook race. Safety issues. I get that. No biggie. I'll use my new playlist for the first two races. What's your race schedule like? Who do you turn to for playlist updates? That trail race looks like fun! I love Tufts!!! Wish I could run this year but I'll be there next year!! I absolutely ask my high schoolers for songs! They always come through! I usually have to clarify though that I don't want anything that would make me blush! So is it sad or cool that my playlist kind of looks like what your high schoolers made for you? :) At double their age, I would have hoped to evolve a little more, but I guess booty-shaking music is awesome no matter how old you get. I get a lot of songs from spin class. I keep my phone out to type in a song if I like it. Fall is my favorite time to run so why not?! You'll have an amazing month!! Now, I'm getting ready for a Fitness Competition! Good luck with your training! You will rock it! I NEEDED the playlist in a major way! Tomorrow is my 3rd 1/2 marathon and I'm hoping to PR. I went through my "tired" music last night and really had no idea what I could add to freshen it up. Thank the girls at school for me! Jog.fm is a great way to find songs with a specific BPM but you have to look through pages of songs to find ones you like it will just list every song around your goal BPM. October is a great month for racing! Starting the second weekend in October I'll race every weekend for 6 weeks and I'm so excited! Good luck with your upcoming races! Yay! So close to MDI! Good luck at all of your races! October is racing month for us too, we have Wineglass tomorrow (technically September but close enough), Reach the Beach: New Jersey, Cape Cod Half marathon and then a 5K the beginning of November. I'm supposed to run a 10K a week from toady, but will have to drop out with this injury. Boo that MCM deferred and this one dropped. However, I am having fun cheering you all on!